A strong storm system will move from the Mississippi Valley through the Appalachians on Sunday. Damaging winds and large hail will be possible, with a few isolated tornadoes in parts of the Ohio Valley southward through the southern Appalachians and northeast Gulf Coast. 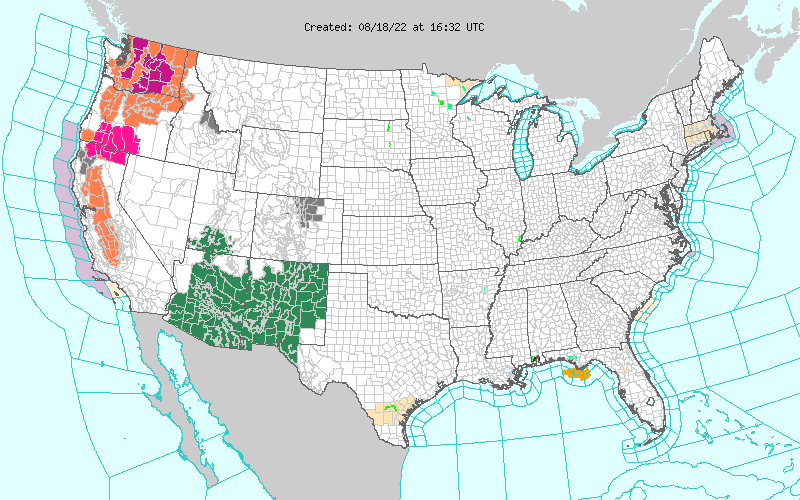 Major storm system will cause widespread major impacts including heavy snow and blizzard conditions from the Rockies to Minnesota, destructive winds, blowing dust, and extremely critical fire weather over the southern Plains, severe thunderstorms, and even some ice. thunderstorms will also develop over parts of the Southern Mid-Atlantic. Hypothermia and Death in the U.S.
QuickStats: Death Rates Attributed to Excessive Cold or Hypothermia Among Persons Aged ≥15 Years, by Urbanization Level and Age Group — National Vital Statistics System, 2015–2017. MMWR Morb Mortal Wkly Rep 2019;68:187. DOI: http://dx.doi.org/10.15585/mmwr.mm6807a8. “…..During 2015–2017, death rates attributed to excessive cold or hypothermia increased steadily with age among those aged ≥15 years in both metropolitan and nonmetropolitan counties. The rate for persons aged ≥85 years reached 3.8 deaths per 100,000 in metropolitan counties and 7.3 in nonmetropolitan counties. The lowest rates were among those aged 15–24 years (0.2 in metropolitan counties and 0.5 in nonmetropolitan counties). In each age category, death rates were lower in metropolitan counties and higher in nonmetropolitan counties. People should also be aware that no sunscreens are “waterproof.” All sunscreens eventually wash off. Sunscreens labeled “water resistant” are required to be tested according to the required SPF test procedure. The labels are required to state whether the sunscreen remains effective for 40 minutes or 80 minutes when swimming or sweating, and all sunscreens must provide directions on when to reapply. The SPF value indicates the level of sunburn protection provided by the sunscreen product. All sunscreens are tested to measure the amount of UV radiation exposure it takes to cause sunburn when using a sunscreen compared to how much UV exposure it takes to cause a sunburn when not using a sunscreen. The product is then labeled with the appropriate SPF value. Higher SPF values (up to 50) provide greater sunburn protection. Because SPF values are determined from a test that measures protection against sunburn caused by UVB radiation, SPF values only indicate a sunscreen’s UVB protection. As of June 2011, sunscreens that pass the broad spectrum test can demonstrate that they also provide UVA protection. Therefore, under the label requirements, for sunscreens labeled “Broad Spectrum SPF [value]”, they will indicate protection from both UVA and UVB radiation. In Europe and in some other countries, sunscreens are regulated as cosmetics, not as drugs, and are subject to different marketing requirements. Any sunscreen sold in the United States is regulated as a drug because it makes a drug claim – to help prevent sunburn or to decrease the risks of skin cancer and early skin aging caused by the sun. TanningThis site is intended to provide a source of general information on skin tanning, ultraviolet (UV) exposure, UV emitting products, and skin protection.